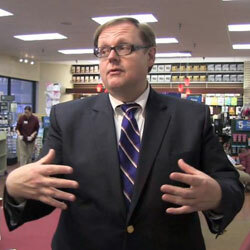 No story about transgender people is too insignificant for Fox News reporter Todd Starnes to cover as a “culture war” horror story, especially if the story gives him the opportunity to use inaccurate and transphobic slurs in his reporting. David Staton, whose wife had the disquieting run-in while eating out at Amerigo, a restaurant in the country music capital, has a simple solution. Staton and his wife were celebrating a date night on Saturday by eating dinner at Amerigo – a regional Italian restaurant chain in Nashville. Sitting just a few tables away was a group of cross-dressers. And Staton’s wife especially noticed them after an encounter in the ladies room of the Nashville establishment. He said it poses a safety hazard – especially for families with young daughters. Starnes’ coverage of the incident is problematic for obvious reasons: inappropriately referring to a transgender person by the wrong gender, using derogatory language, and peddling the baseless “bathroom panic” myth, to name a few. But it’s also worth noting that no major news outlet aside from Fox has covered the story. Aside from the few right-wing outlets piggy backing off of Starnes’ report, no other serious news publication found the incident worth reporting. That’s because someone being bothered by the presence of a transgender person isn’t a news story. Nor is it a story when a restaurant voluntarily allows a transgender woman to use a restroom that matches her gender identity (Tennessee’s non-discrimination laws don’t protect transgender people). 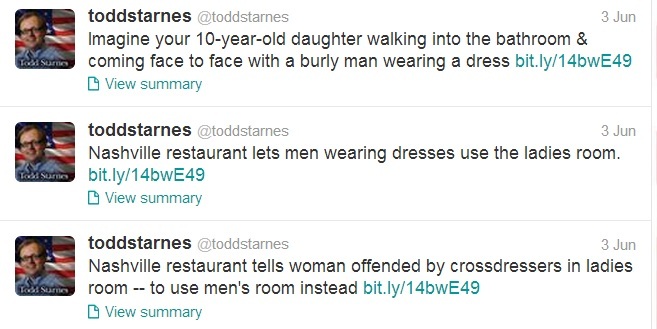 Only in the mind of Todd Starnes – a man who’s made it his mission to gin up anti-LGBT sentiment with throwaway “culture war” stories – does this kind of incident qualify as newsworthy.